EPI Economist Monique Morrissey delivered the following testimony before the Philadelphia City Council’s Labor and Civil Service Committee on June 15, 2016. My name is Monique Morrissey. I am an economist at the Economic Policy Institute and author of The State of American Retirement: How 401(k)s Have Failed Most American Workers, an interactive chartbook accessible through EPI’s website, www.epi.org. Before I move on to the topic of our private retirement system, I would like to say a word about Social Security. Social Security is the cornerstone of our retirement system, but it is not enough. Benefits replace slightly less than 40 percent of pre-retirement earnings for a middle-class worker, and this share is declining. Most experts think we need to replace 70–80 percent of our income in retirement.1 So Social Security benefits currently provide roughly half of what a middle-class worker needs. If this seems like an unattainable goal to you, you are not alone. 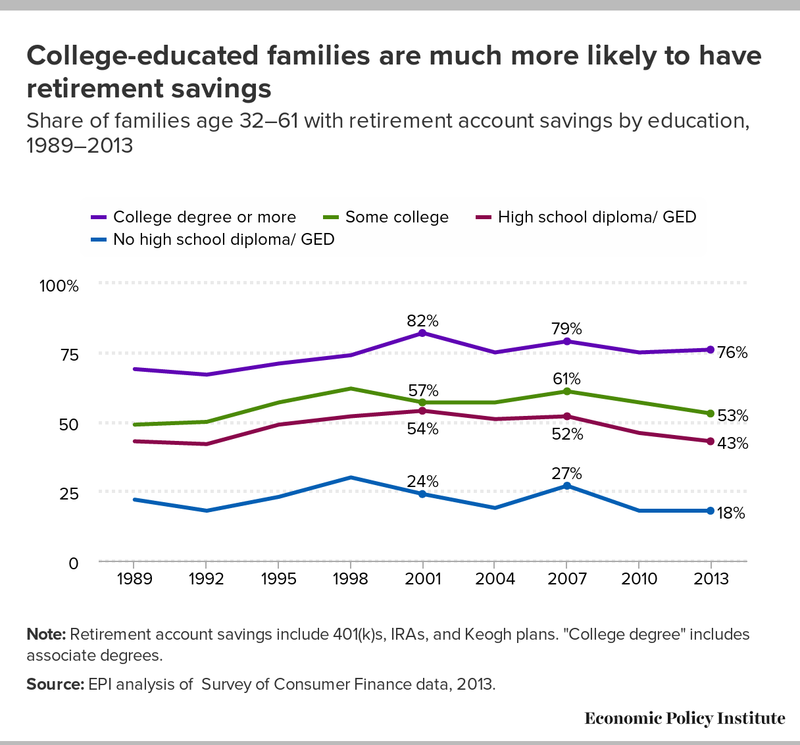 The Boston College Center for Retirement Research estimates that fewer than half of working-age households are on track to accumulate sufficient savings and benefits to maintain their pre-retirement standard of living (Munnell, Hou and Webb 2014). 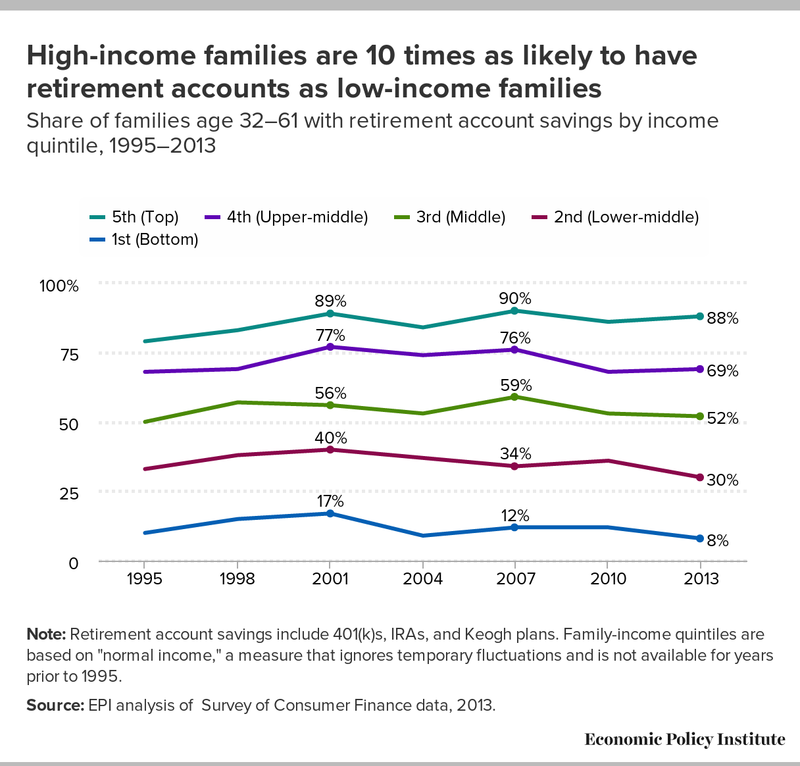 The Center uses conservative assumptions, such as assuming every penny of savings, including home equity, is tapped in retirement. Moreover, the share of households at risk of seeing a significant drop in living standards at retirement is growing as younger households fall further behind. This is a historic reversal. Until now, each generation had more retirement security than the last due to a gradual expansion of Social Security benefits and coverage. Now, however, Social Security’s replacement rate is eroding due to benefit cuts enacted in 1983 that are gradually being implemented. This includes an increase in the normal retirement age that is equivalent to a 13 percent benefit cut, and an increase in the share of benefits subject to income tax as limits on untaxed benefits are not indexed to inflation. These benefit cuts were implemented in 1983, right around the time 401(k) plans came on the scene. In hindsight, these cuts were a mistake. Policymakers are beginning to realize this. Last year, almost every Democratic senator supported a budget amendment calling for Social Security expansion, and both Democratic presidential candidates support expansion. Republicans, meanwhile, appear to be retreating from previous calls to cut benefits. The Republican presidential candidate has said he will protect benefits, though he appears to be under pressure to reverse his position. (While Republican voters strongly support Social Security, their big-money donors do not.) This is a big shift from when I started working at EPI 10 years ago, when the question was not whether to expand Social Security or leave it alone, but rather how much to cut benefits. What has changed? There is a growing recognition that the 401(k) revolution has failed. A quarter century after participation in 401(k)-style plans surpassed that in traditional pensions, most Americans have little or nothing saved in retirement accounts. Pension benefits remain six times as important to seniors as retirement account distributions. It should be no surprise that 401(k)s were a bust. They were designed to supplement, not replace, pensions. They shift most of the cost and all of the risk of retirement on to workers. They are inefficient compared with pensions, which pool longevity and investment risk at no cost to workers or employers. 401(k) participants also face higher fees and earn lower net returns. The problem is often defined as people not saving enough, but many people have rational reasons for avoiding a high-cost, high-risk system. Tax incentives for retirement saving are upside down—worth much more to taxpayers in higher tax brackets who can afford to take on more investment risk. Low-income workers often receive little or no help from their employers or the government, yet face penalties if they need to access savings before retirement. 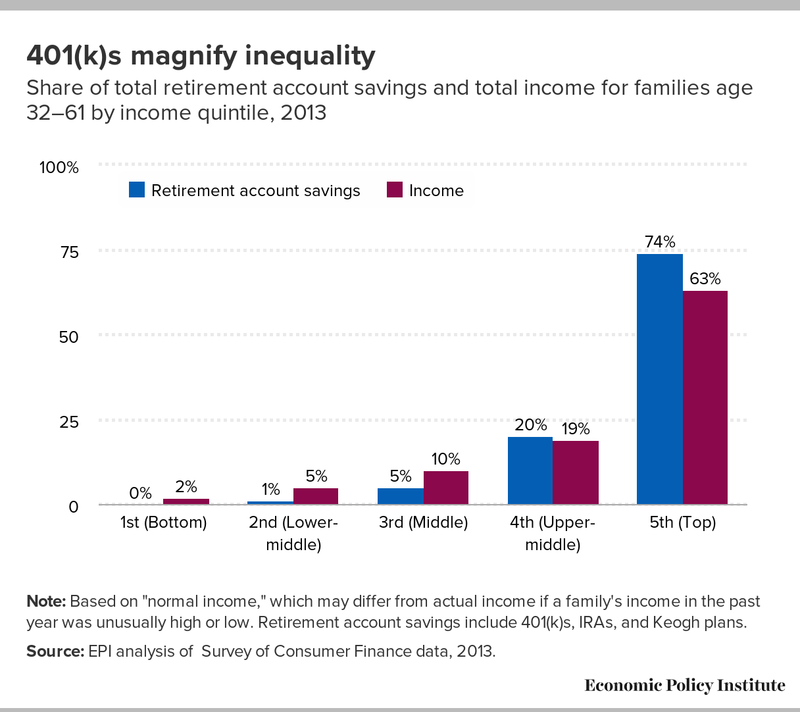 401(k) plans magnify inequality. 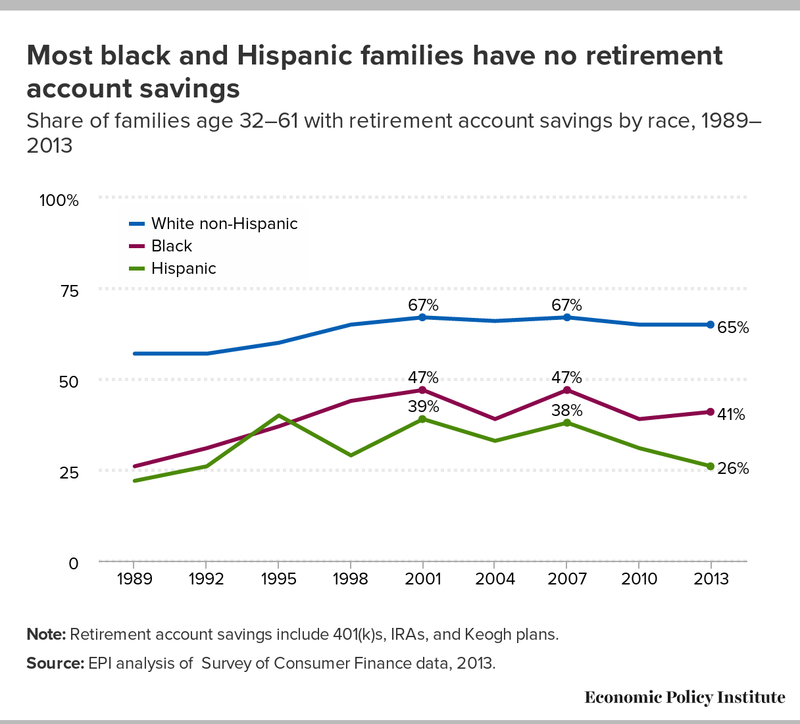 While 401(k)s have failed the overwhelming majority of Americans, some groups have fared worse than others: lower-income, black, Hispanic, less-educated, and unmarried Americans. 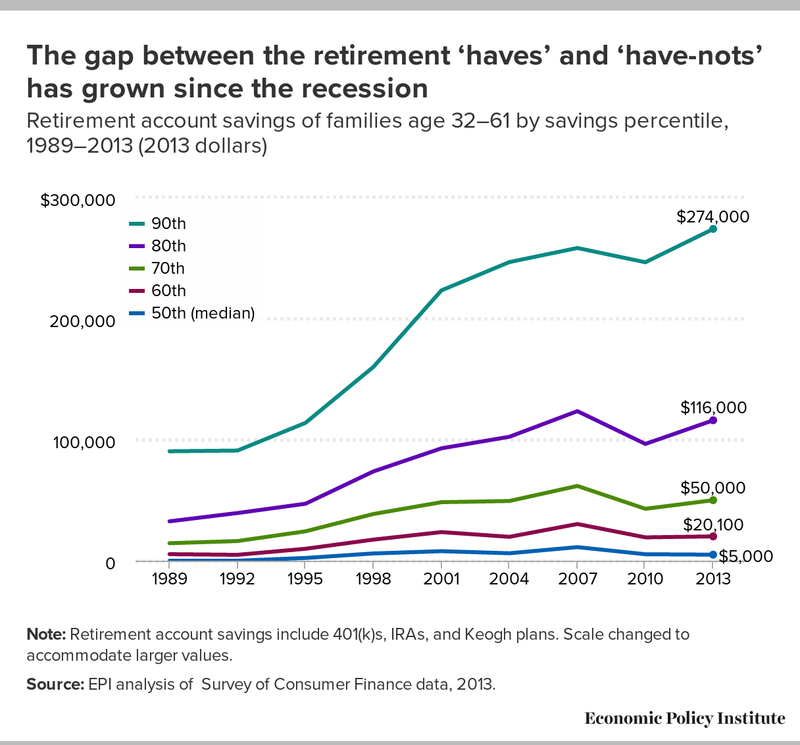 For these groups, the typical working-age family or individual has no savings at all in a retirement account. And while women appear to be closing some gaps with men, their longer lifespans and lower lifetime earnings still put them at greater risk in old age. Only the financial services industry and the top 1 percent of Americans, for whom 401(k)s serve as a tax shelter more than a retirement vehicle, have an interest in maintaining the current system. Note: Based on "normal income," which may differ from actual income if a family's income in the past year was unusually high or low. Retirement account savings include 401(k)s, IRAs, and Keogh plans. Note: Retirement account savings include 401(k)s, IRAs, and Keogh plans. Family-income quintiles are based on "normal income," a measure that ignores temporary fluctuations and is not available for years prior to 1995. Note: Retirement account savings include 401(k)s, IRAs, and Keogh plans. "College degree" includes associate degrees. Note: Retirement account savings include 401(k)s, IRAs, and Keogh plans. Inequality is not news—we have learned to expect it. 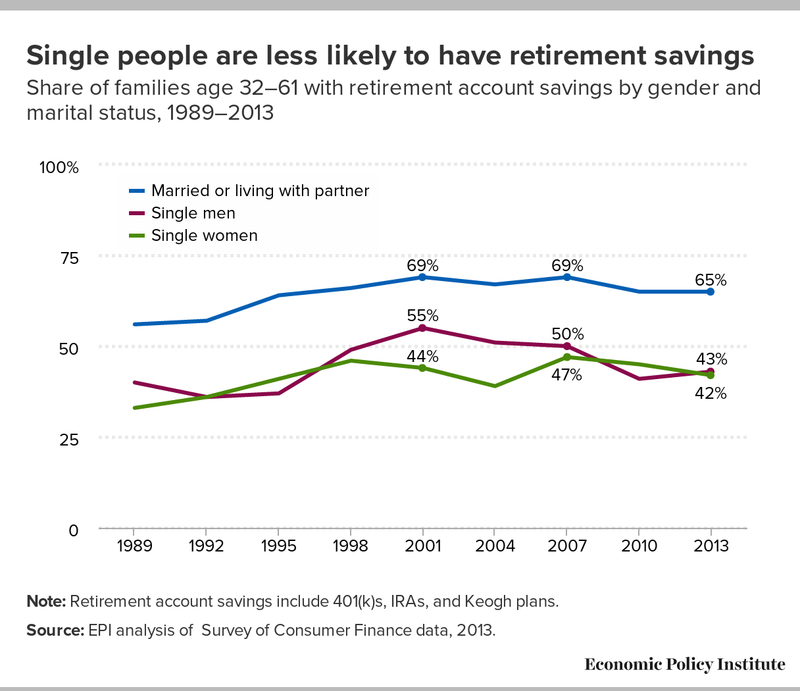 The surprising thing is that we used to have a fairly egalitarian retirement system and no longer do. Social Security is and has always been a great equalizer, and traditional pensions at least do not exacerbate inequality. Before the 401(k) revolution, black workers were almost as likely to participate in pensions as white workers, and high school–educated workers were almost as likely to participate as college-educated workers. This remains true for workers lucky enough to participate in these pensions. But there are now more than twice as many workers in 401(k)-style plans as traditional pensions, and as we have seen, participation in 401(k) plans is very unequal. What needs to be done? First and foremost, we need to reverse Social Security cuts and expand benefits across the board. To do this, we need to raise revenues, starting by lifting the cap on taxable earnings. As Warren Buffet has pointed out, he faces a lower tax rate than his secretary because earnings above $118,500 are not subject to Social Security tax. I am also in favor of very slowly increasing Social Security contributions for all participants, split equally between employers and employees, to offset increases in life expectancy. Third, we need new solutions for workers whose employers are not in a position to provide traditional pensions. States are experimenting with hybrid plans that provide workers with some of the advantages of pensions without requiring employers to take on long-term liabilities. The California Secure Choice Plan, for example, is a good model, especially if California adopts a reserve fund to provide intergenerational risk smoothing. In short, we face a looming retirement income crisis brought on by ill-timed Social Security cuts and a shift from secure pensions to risky, high-cost, and highly unequal 401(k) plans. However, this crisis can be averted if policymakers rise to the challenge of fixing our do-it-yourself retirement system. I thank the Philadelphia City Council for addressing this issue. 1. Social Security’s replacement rate is somewhat higher for lower-income workers and somewhat lower for higher-income workers due to a progressive benefit structure. However, lower-income workers need a higher replacement rate to maintain their standard of living in retirement because they will see less of a decline in expenses after retirement. 2. This rule of thumb is sensitive to interest rate and other assumptions. Morrissey, Monique. 2016. The State of American Retirement: How 401(k)s Have Failed Most American Workers. Economic Policy Institute. Munnell, Alicia H., Wenliang Hou, and Anthony Webb. 2014. NRRI Update Shows Half Still Falling Short. Boston College Center for Retirement Research, Issue Brief #14-20.